The Union Jack is the only official flag of Northern Ireland. The well known red hand flag has not been used officially since 1973. This was a civil flag for Northern Ireland, but the status of this was abolished when the Belfast Stormont assembly was closed down in 1973. Thereafter, the Union Flag was made official for all purposes in Northern Ireland. What law was being changed when this flag was abolished? No law as such was involved. The closing of the Stormont Parliament (and the consequent removal of official status from the flag of Northern Ireland) predates the 1995 amendment to the 1993 Regulations (which specifically refers to "National Flags") by over 20 years, and so the amendment simply did not (and does not) apply. My understanding is that the defaced St George's cross [bearing the red hand, white star and crown] was the arms of the Government of Northern Ireland and not Northern Ireland itself, nor the Royal Arms for use in Northern Ireland. This is why the Northern Ireland flag used by the Unionists [the red hand flag] is no longer official as that government was abolished and its arms went with it. I suspect this [issue of royal arms of Northern Ireland] is one of those issues that has just been fudged because no one wants to face the almost inevitable furore that would follow an official pronouncement of the arms of Northern Ireland, or rather of the Royal Arms for use in Northern Ireland. As far as I can see they should be quartered Ireland, England, Scotland, Ireland with the hart crest. As for supporters they could either both be the red lion and elk (as in the old Government of Northern Ireland arms) bearing the two banners, or they could be a combination of an elk and a English lion, although perhaps it should be a hart and a Scottish unicorn as the majority of Northern Irish are of Scots descent rather than English. The Royal motto of Northern Ireland is "Quis separabit" (Who will separate us) - a motto that can be taken a number of ways. Searching for information on the Governor of Northern Ireland's flag I noticed that on the Government flag (white field, red St George cross, red hand and crown above) that a few illustrations show a "Tudor" style crown as opposed to the Edwardian version. Is this a mistake I wonder? This flag was officially adopted in 1953, and this would seem to indicate that it should be an Edwardian crown. The flag is a "Banner of Arms" and although the Arms most certainly would have the Tudor-style crown, surely when the flag was officially adopted this would have been changed. The Tudor crown I noticed is of the same style in silhouette as the crown on the Governor's flag depicted in Flaggenbuch (1992), but with more pearls and a more intricate base. Although authorized under the Warrant of 1924, I understand that the Government flag only received widespread use following the receipt of Royal Assent on 29 May 1953, it follows therefore, that the St Edward's Crown is the one to show, since any earlier flags (whilst perfectly legal under the Laws of Arms) were apparently not officially used? Although some versions of the flag of the Government of Northern Ireland have no doubt been made with St Edward's crown, I suggest that any 'correct' version should have the Tudor crown. As a general 'rule' flags that are banners of arms, or have seals as badges should not be modified unless the arms or seals are altered. When the Tudor crown was introduced with the accession of Edward VII, those flag badges based on seals that included a crown, were deliberately not modified until after the seal had been amended. The arms of Northern Ireland were not altered when the St Edward's crown replaced the Tudor crown. Therefore the crown on the flag should not have been changed. A photograph of a flag bearing the Tudor crown, as used in the late 1940's for the Royal Victory Tour of South Africa, can be seen here. "There is no illustration of either the original grant of arms of 1924, nor of the flag of 1953 on record, there is however, one of the arms as augmented by the addition of a compartment (ref. 183.321) on 6 January 1971, and this (as you would expect) shows the St Edward's Crown (which may be seen in Burroughs, 1971 Edition, p. 246." In books of the 1950s and 60s the flag is consistently shown with a squared-off Tudor crown. Subsequently, in 1971: The crown in the arms of which the flag is a banner was re-drawn with a St Edward's crown. In 1973, the government of Northern Ireland was abolished. It is therefore I suggest a reasonable generalisation to say that the official government flag had the modified Tudor crown, while the flag used unofficially since 1973 has had the St Edward's crown. The overall dimensions of the flag are 60 x 120 units. The thickness of the cross is 12 units. The 6-pointed star is contained within an imaginary circle of 30 units in diameter, whilst the red hand's height is 15 units. Christopher's notes also inform us that the flag was designed by Sir Gerald Wollaston (then Norray and Ulster King of Arms) and was established as a Banner of Arms by a Warrant of King George V dated 02 August 1924. The flag became widely used after Royal Assent was given on 29 May 1953, and was effectively abolished following the Northern Ireland Constitution Act of 1973. There may have been many variants of both strains here if we consult various Flag books. Sometimes the Tudor crown appears more elaborate than the version shown above - this version is reasonably similar to a flag that Bruce Berry has in his collection from the 1940's. I have used the same crown as Flaggenbuch shows on Governor-General's flag. In Christian Fogd Pedersons book of 1970, an Edwardian crown is used, although the star is much smaller. The reason that the College of Arms could not find the 1924 grant of arms is that it was designed and made in Dublin by Ulster King of Arms. Neville-Rodwell Wilkinson, Ulster King of Arms, drafted designs for the flag in February 1923, and the great seal in April 1923, and held discussions with Northern Ireland officials in London from January 1924 regarding the coat of arms. The final design was completed by Wilkinson's deputy Thomas Ulick Sadleir for approval by the Northern Ireland cabinet in April 1924. The artwork was approved and the Royal warrant signed by George V and issued through the Home Office on 2nd August 1924 and registered in the Register of Arms in Dublin. Source: "Royal Roots, Republican Inheritance - The Survival of the Office of Arms" by Susan Hood, published in Dublin in 2002, page 120. Argent a cross gules, overall on a six pointed star of the field ensigned by an Imperial crown proper a dexter hand couped at the wrist of the second. Given at our Court of St. James in the 15th year of our reign 2nd August 1924 by His Majesty's command." The supporters were granted in the following year, and can be seen on folio 66 of the same volume of the Register. The office of Ulster King of Arms continued in Dublin until 1943, dealing with armorial matters north and south of the border until that date. The College of Arms only had jurisdiction in Northern Ireland from that date. The pre-1972 Northern Ireland flag, though no longer used by the Government there, was used officially at the recent Commonwealth Games in Glasgow, being carried in procession before the Northern Ireland team, and hoisted at appropriate medal ceremonies. The red hand of Ulster comes from a legend from one of Ireland's many legendary invasions. The leader of a war party promised a prize to the first man to touch land with his right hand; so the winner, a left-handed man, cut off his right hand and threw it onto the shore. I have read most of the pseudo-historical works that describe the mythological invasions of Ireland - 'Leabhar Gabh�la �ireann', 'Foras Feasa ar �irinn', 'Ann�la R�ochta �ireann', and I have not come across such a story. "It is not really known what the origin of the 'red hand' is but it is associated with various Ulster lineagaes. A poetic dispute from the 16th century is extant which indicates that S�ol R�ra� (McGuinnesses) and the northern descendents of Niall Naoighiallach (O'Neills) claimed the exclusive right to use the red hand as a symbol. It is significant that the red right hand is widely found in Irish heraldry, especially in Ulster, e.g. in the arms of the O'Neills, McCartans, O'Donnellys, O'Dunlevys, and McGuinnesses. It is clear that the human hand was a basic element in pagan Irish imagery." I might add that the ancestors of the McGuinnesses were displaced as rulers of Ulster by the ancestors of the O'Neills in the 5th century. The fact that they were disputing ownership of the red hand a thousand years later suggests that by the 16th century it was associated with the province. A yellow flag with a red cross, bearing a white shield charged with the red hand of Ulster, is a banner of the arms of the traditional province of Ulster. Sometime after Northern Ireland was formed as a separate self-governing entity in 1922 it adopted arms based on, but not the same as, Ulster, with which it is not coterminous (three of Ulster's nine counties being in the Republic). Presumably the Northern Irish arms were deliberately made more "British" with the addition of the crown and the changing of field to make it look like the St. George's cross. Interestingly, when these arms were displayed on a flag badge in the Governor of Northern Ireland's flag, the disc was yellow, not the customary white. The six-pointed star represents the six counties of Ulster that make up Northern Ireland. Other Ulster counties are in the Republic. The traditional flag of the province of Ulster is similar to the flag of Northern Ireland, but the field is yellow rather than white, and the red hand is on a white shield rather than a star, no crown. The Ulster arms, of which the flag is a banner, has an upright red cross on a gold field - a design derived from the arms of the de Burgos who were earls of Ulster until the line became extinct. The flag is commonly seen in the Ulster counties of the Republic. It also has a certain currency among nationalists in Northern Ireland but has always been overshadowed there by the Irish Tricolour and is more likely to be seen as part of a display of all four provincial flags than on its own. It doesn't begin to approach the popularity which the Northern Ireland flag has among unionists and so is a relatively uncontentious and unpoliticised emblem and is used in sports in which Ulster teams compete. The Northern Ireland flag was introduced in 1953 but it is a banner of arms which had been used by the government of Northern Ireland since 1925. Interestingly, the supporters of the shield in those arms each carry a banner: one is a crowned harp, gold on a blue field, the other is the red-on-gold cross of the de Burgos. Northern Ireland has its own soccer team and the red-handed flag is used in all European and world football events. A few days ago the draw was held for the qualifying groups for the European championship in 2000 and there it was, used by UEFA (Union of European Football Associations). It seems to my mind this perpetuates an error. I was under the impression that the Banner of Arms of The Province of Ulster would have had a red left hand on the shield, as this is what is used in the Coats of Arms of Baronets (and is often described as the badge of Ulster). I understood that when Ulster King of Arms was creating the Coat of Arms for the Government of Northern Ireland, Northern Ireland (six counties) was differentiated from the Province of Ulster (nine counties) by changing the hand from a left hand to a right hand. It is now rare to see a representation of the Ulster Coat of Arms, or Banner of Arms with the left hand. 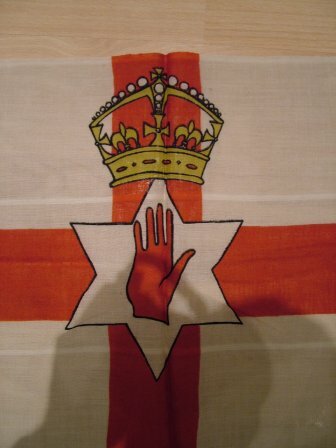 designed by Sir Gerald Wollaston, then Norray and Ulster King of Arms; a white flag carrying the cross of St George, with a white six pointed star carrying the red hand of Ulster in the centre of the cross, the star being ensigned by the imperial crown. In November 1973 the College of Arms advised that it would be improper to use the Northern Ireland Coat of Arms after the Northern Ireland Constitution Act 1973 had been passed. The effect of this has now been overtaken by The Flags Regulations (Northern Ireland) 2000 which prohibits the flying of any flag on Government buildings, other than the Union Flag, and in certain circumstances, the Europe Flag, the Flag of a visiting Head of State, or the Royal Standard. The Northern Ireland flag (the one that ceased to be official in 1973) is still used by the Northern Ireland team at the Commonwealth Games. In 1970 the Ulster Defence Regiment was formed within the British Army to replace the B-Specials, Royal Ulster Constabulary auxiliaries, who were tainted with Protestant bias and a reputation for brutality (somewhat like the Black and Tans fifty years earlier). The UDR were a regiment of part-time soldiers much like the Territorial Army (reserves) in the rest of Britain. Like the rest of the Army each infantry battalion was entitled to carry a stand of two colours - Queen's (Union Jack) and Regimental. The UDR also became slightly tainted since it was very hard to recruit Catholics. In 1992 the UDR was merged with a regular army regiment, once again to help boost its image and reputation. A year previously, as the unit faced extinction in the form it has known for 21 years, the Queen went to Northern Ireland to present the first ever colours to four of the nine UDR battalions. The colours of the battalions are identical except for the battalion number in Roman numerals in the upper canton. In the center is a circlet inscribed with the regiment's name in gold. In the circle is the regimental badge, a rather plain harp (variations of which are common to most Irish regiments) surmounted by a crown. Around the circlet is a "union wreath" of roses, thistles and shamrocks (a uniform design for the whole army), the whole surmounted by another larger crown. The flags look very bare compared to the rest of the army's which are cluttered with battle honours on gold scrolls around the union wreath. An interesting photograph was found at http://imperialflags.blogspot.com/2009/03/ulster-flag.html, showing the use of a plain union flag, with a red hand centred, on the offices of the Belfast Telegraph in Fleet Street (London). The original caption stated "Original caption: Ulster flag in London for Empire Day. An Irish newspaper office in fleet street. London, flew the new Ulster flag for the first time recently. The Ulster flag is the Union Jack with red hand in the centre." The date is uncertain, but likely early 20th century, based on the use of the red ensigns as national flags beside this flag. The Northern Ireland think tank Democratic Dialogue published a discussion paper concerning the controversy over flags and emblems in the province. One central idea in the paper is to hold a design competition to find a new flag for the province. For more details, see the Democratic Dialogue web page. Other reports were reported in the Belfast Telegraph, Irish News, and ireland.com. 15.A Commission on Flags, Identity, Culture and Tradition will be established by June 2015 as the basis for further addressing these issues, to report within 18 months of its being established. The Commission shall consist of fifteen members, seven of which will be nominees appointed by the leaders of the parties in the Executive. These will comprise two members for each of the two largest parties and one for each of the three next-largest parties in the Northern Ireland Executive, all as measured by their number of seats in the Northern Ireland Assembly. The remaining eight members of the Commission will be drawn from outside of government. The report and recommendations will be agreed by a majority of the overall Commission, including at least five of the seven members appointed by party leaders. Its remit will focus on flags and emblems and, as required, broader issues of identity, culture and tradition, and seek to identify maximum consensus on their application. In its work, it will be guided by the principles of the existing Agreements including parity of esteem. As the Commission's work may touch on expressions of sovereignty and identity, it may consult the UK and Irish Governments.